Average insurance rates for a Hyundai Sonata are $1,412 a year with full coverage. Comprehensive insurance costs around $280 a year, collision insurance costs $512, and liability costs $440. Liability-only coverage costs as little as $510 a year, and high-risk coverage costs $3,050 or more. 16-year-old drivers receive the highest rates at up to $5,348 a year. Prices include $500 deductibles, 30/60 liability coverage, and includes both medical and uninsured motorist insurance. Rates are averaged for all U.S. states and Sonata trim levels. Using a 40-year-old driver as an example, prices range range from the low end price of $510 for minimum levels of liability insurance to a high of $3,050 for a policy for a high-risk driver. Your location can make a big difference on insurance rates. Areas with sparse population tend to have lower incidents of collision claims than congested cities. The diagram below illustrates how rural and urban location affects auto insurance rates. These examples demonstrate why it is important to compare rates for a specific zip code, instead of making a decision based on rate averages. 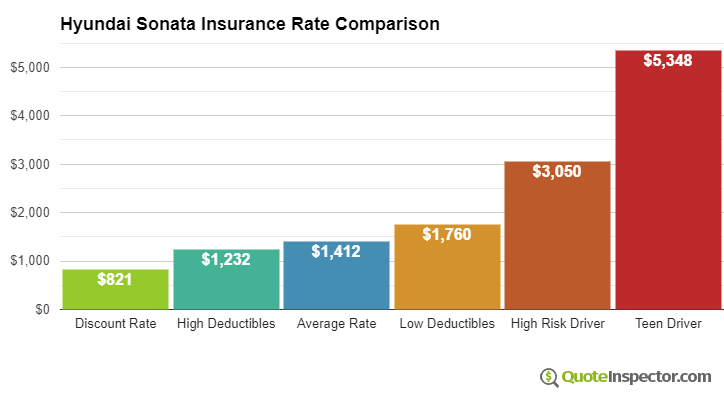 The chart below details average Hyundai Sonata insurance rates for additional coverage choices and driver risks. Car insurance rates for a Hyundai Sonata can also vary considerably based on the trim level of your Sonata, your age and driving habits, and deductibles and policy limits. 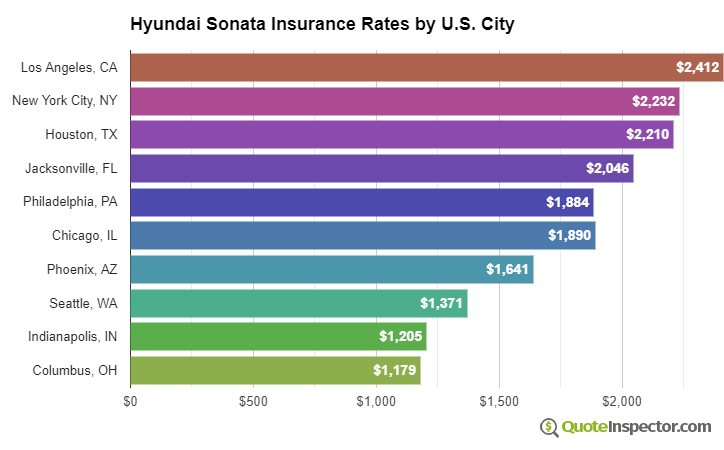 Where you live makes a big difference in Hyundai Sonata insurance prices. A 40-year-old driver could pay as low as $1,020 a year in states like New Hampshire, Ohio, and Utah, or at least $1,910 on average in Florida, Michigan, and New York. Rates are averaged for all Hyundai Sonata models and trim levels. Rates assume a 40-year-old male driver, full coverage with $500 deductibles, and a clean driving record. 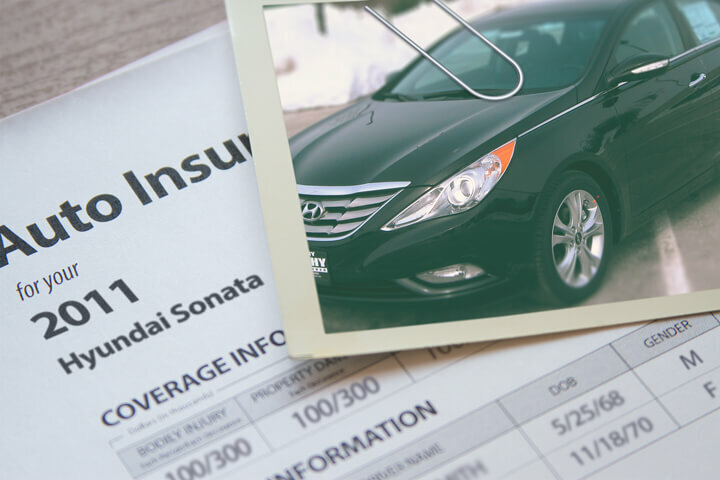 Saving money on insurance for a Hyundai Sonata not only requires not taking risks behind the wheel, but also having a positive credit history, eliminating unnecessary coverage, and consideration of higher deductibles. Comparison shop every year by getting quotes from direct companies like Progressive, GEICO, and Esurance, and also from your local independent and exclusive agents. The following is a quick rundown of the coverage data raised in the charts and tables above.